I am now making baritone dulcimers in addition to my standard models. The baritone dulcimer is set up to be played in A-E-A and other tunings in that vicinity. The design of my baritone is similar to my standard model but there are a few differences. The string length for the baritone is 28 1/4″ compared to 25 15/16″ for the standard and it is strung with heavier strings. The shape is based on my standard design but is several inches longer and the sound box is deeper. 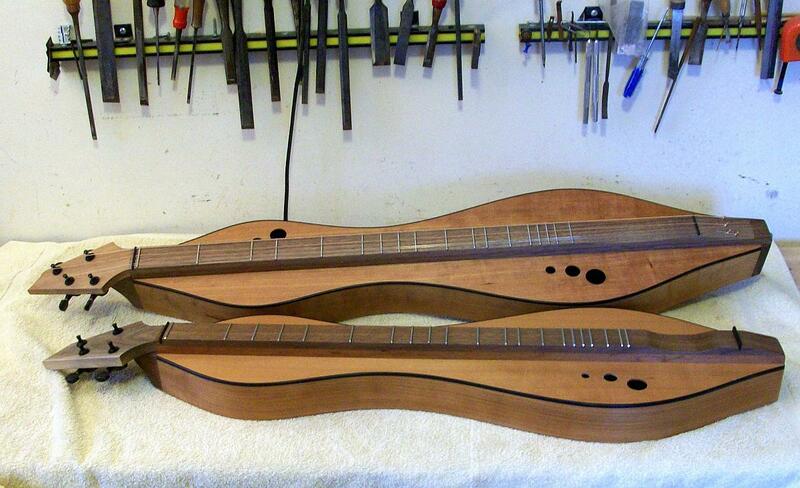 Here is a baritone dulcimer behind its standard-sized sibling. Getting these two dulcimers to sit still for the picture took a lot of work. The baritone kept telling the standard dulcimer that it was bigger so it was in charge. The standard yelled that it was going to tell mom. After they engaged in some pushing and shoving I sternly told them both, “Don’t make me have to stop this workshop!” I snapped the picture quickly before the chaos resumed…. I just shipped it to its new owner so I’ll have to make another before I can make a sound file. Should have thought of that earlier! It has a wonderful midrange oomph! Don’t upset DAD (pun intended). Oh, wow! Hope to hear sound files of a baritone dulcimer–that is one intriguing instrument!